"We’re thrilled that Roku is recognized for making America’s favorite streaming players"
SARATOGA, Calif.--(BUSINESS WIRE)--Roku Inc. today announced that it has sold 10 million Roku® streaming players in the United States. Since the company’s May 2008 unveiling of the very first device to stream Netflix to the TV, the popularity of streaming players has grown rapidly with Roku leading in popularity. In addition to the growth in adoption of streaming players, consumers are showing a clear preference for the streaming players they use most. In a recent study1, consumers were asked how often their household uses a device to stream video to the TV. Roku is the most popular choice among streaming players accounting for an aggregate 37 million hours of video streamed per week compared to Apple TV at 15 million hours, Chromecast at 12 million hours and Amazon Fire TV at six million hours. In addition, when consumers were asked how likely they are to refer a friend to a device, Roku was the leading choice with a Net Promoter Score of 46, followed by Apple TV at 30, Chromecast at 23 and Amazon Fire TV at 15. There is a ton of entertainment available on Roku including more than 1,800 streaming channels. That’s 1,000 more channels on Roku than other streaming devices. Roku customers have streamed five billion hours since 2008 and are expected to stream three billion hours in 2014 alone. Roku players are used in all 50 states but the top Roku metros are the San Francisco Bay Area; Washington, D.C.; Seattle; Atlanta; and Phoenix. In celebration of the 10 million milestone, Roku is running a social sweepstakes on Facebook. Ten Roku 3 players will be given away over the 10-day sweepstakes. More details can be found at: http://bit.ly/Roku10Million. Roku is the creator of a popular streaming platform for delivering entertainment to the TV. The Roku platform features a vast collection of entertainment channels available for streaming. Roku streaming players and the Roku Streaming Stick™ are made by Roku and sold through major retailers in the U.S., Canada, the U.K. and the Republic of Ireland. Additionally, Roku works with TV manufacturers to create co-branded Roku TV models. The first Roku TV models are now available in the U.S. from TCL and Hisense. Roku was founded by Anthony Wood, inventor of the DVR. 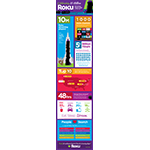 Roku is privately held and headquartered in Saratoga, Calif., U.S.
Roku is a registered trademark and Roku TV and Roku Streaming Stick are trademarks of Roku Inc. in the U.S. and in other countries. 1 July 2014 proprietary consumer study conducted for Roku by The NPD Group, Inc.